Home / -Vintage Video- / Marvin Gaye / Vintage Video / Vintage Video: Marvin Gaye Hits Number 1 on the Hot 100 and R&B Singles With "I Heard It Through the Grapevine"
Vintage Video: Marvin Gaye Hits Number 1 on the Hot 100 and R&B Singles With "I Heard It Through the Grapevine"
It really wasn't Marvin Gaye's song but, today, his recording is considered one the greatest classics from the Motown cannon. "I Heard It Through the Grapevine" was written in 1966 by Norman Whitfield and Barrett Strong, the man who had Motown's first big hit with "Money (That's What I Want)", with the intention of having it recorded by the Isley Brothers but, for some reason, that recording was never made. It's believed the first recorded version was that same year by Smokey Robinson and the Miracles but wasn't released until their 1968 album Special Occasion. Gaye's was the second version recorded, in 1967, but label head Berry Gordy rejected it as a single and it was put on the shelf. That led the way for Gladys Knight and the Pips to enter the studio and their uptempo version was put out on September 28, 1967 on the Soul label. The record went to number 2 on the Hot 100 and the top of the R&B Singles. Producer Whitfield wanted Gordy to still release the Gaye version as a single by the Motown head balked, saying they already had a hit with the Pips. The Gaye version was put on his 1968 album In the Groove where DJ's found the song and started playing it, forcing Gordy's hand. 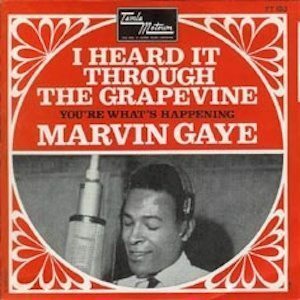 So, on October 30, 1968, I Heard It Through the Grapevine was finally made a single and, just over six weeks later, it hit number 1 on both the Hot 100 and the R&B Singles (December 14, 1968).